I am a big soup lover – especially homemade soups. When I was a teenager, a family friend made some Hamburger Soup for us after my father died, and it was delicious. Since she had included the recipe with it, it quickly became a regular fall/winter meal for my mom and I (my brother wasn’t such a big fan). Now that we have entered the crisp fall days, I got the recipe from my mother again – and here it is! I am not sure of the original source, and I have seen MANY hamburger soup recipes floating around that are very similar – and I have even tried a few, but this is my fav. In a stock pot (or slow cooker if you like) combine all ingredients; let simmer on stove for a few hours (vegetables should be tender) and serve. Not only will you have a hearty meal, but your house will smell amazing too! I am a dipper, so I always like to serve soup with a slice of thick bread or a bun to dip with….delicious! 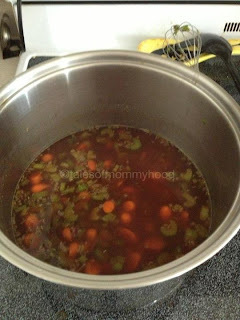 I was just talking about hamburger soup yesterday... so it is so neat to see you post this recipe ... looks like it is time to make it. My husbands Mom used to make this soup when he was little and he always talked about how tasty it was. I'll have to make a batch and surprise him. Thanks for the recipe! SOOO yummy sounding! And what a great soup for Fall :) I love how comforting and warm soup is. Thanks for sharing! I looooove soup too! This sounds like a nice, easy recipe and customizable. I'd probably be inclined to spice it up a bit or perhaps try replacing the hamburger with sausage. I will have to try this one. I think the whole family would love it. Thanks for sharing. The pot and recipe look amazing. Would love to see a picture of a bowl full. I love to have tons of "stuff" in my soup!